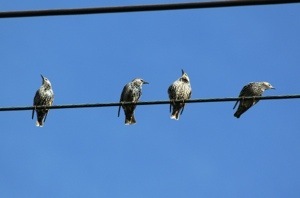 Ever notice birds perched on a electrical line? Did you happen to notice if they were all facing the same direction? Did you by chance notice if they were facing a particular direction, say due South? Turns out, birds choose to face into the wind while on the wire and often in flight. The compass direction does not matter. Why? They use the wind for added lift when returning to flight. It also smooths rather than ruffles their feathers, creating less drag. facing adversity head on will smooth the way.